This is an easy recipe for chicken thighs that's Asian-inspired. The marinade is tangy and spicy, and with a hint of nuttiness from the sesame oil. Adjust the amount of chili flakes and sriracha to your liking! 1. Stir together all the marinade ingredients. 2. 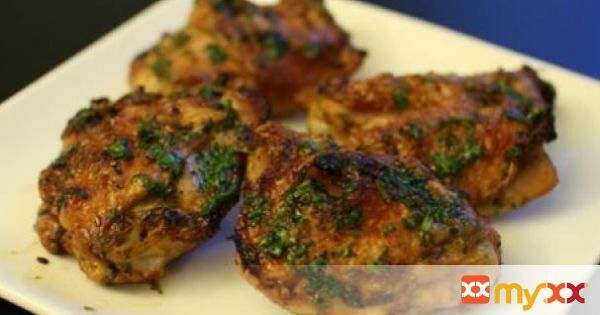 In a small container, refrigerate 3 tablespoons of the marinade to drizzle over cooked chicken. 3. Wash the chicken thighs and pat dry with a towel. 4. For marinading the chicken thighs, place the thighs in either a container with lid or large ziploc bag. 5. Pour Spicy Thai Marinade with Cilantro over the chicken and mix well. 6. Refrigerate at least 4 hours or preferably overnight/24 hours. 7. Adjust the oven rack to top third, so it’s about 8 inches from the top heating element. 8. On a broiling pan, place thighs skin side down. 9. Broil, 16 – 18 minutes. 10. Flip the thighs so skin side is up. 11. Broil, 12 – 14 minutes. 12. Serve with the side of reserved 3 tablespoons of marinade.